Mark Benden, Associate Professor of Environmental and Occupational Health at Texas A&M Health Science Center, is looking to change all that. Too much sitting is bad for our health, he said, and students are now facing a host of challenges that may stem in part from too much time in a chair, including obesity and attention disorders. 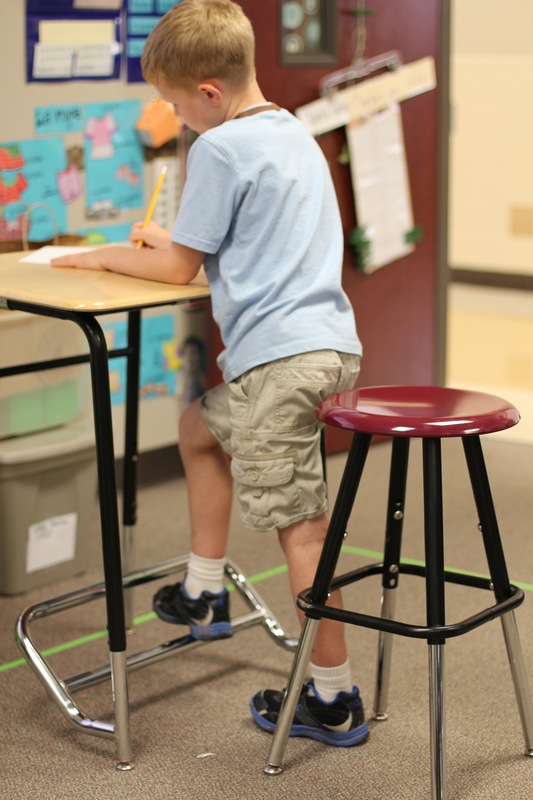 So five years ago, Benden and his team began studying what happened to students when they got out of their traditional seats and moved to standing desks. Their findings, published in a new piece in the International Journal of Environmental Research and Public Health, come from a group of 374 elementary school students in College Station, Texas. Students divided into a (traditional desk) control group and a standing desk group were equipped with biometric monitors - what Benden described as “research-level Fitbits” - attached to their arms, which tracked several measurements, like heart rate and intensity of movement, and then calculated their caloric burn. The desks were designed and built locally at Stand2Learn, an A&M faculty-led startup of which Benden maintains part ownership. While burning calories is certainly important, the real question in classrooms is whether standing desks improve learning. Benden said he brought in Texas A&M’s educational psychology department through a special grant to study whether students were more engaged with the teacher and with their work when they were standing. The psychologists, who were blinded to the study, sat in classrooms for two years watching students and measuring their attentiveness and engagement using a series of markers like how many times students looked at the teacher, how often they wrote on their papers, and how often they were distracted by a neighbor. The results of the study, to be published later this fall, were significant: students were more engaged in activity permissive learning environments than in traditional seated environments. And once again, the children who were overweight and obese showed larger improvements in attention than normal-weight children. Educator Katie Caritey has two standing desks for her 24 second graders, but believes that all her students would benefit from using them. She dreams of having more. The desks were provided by a grant six years ago at Mary Lee Burbank School in Belmont, Massachusetts, and for now students take turns. But what if standing desks -- and yoga balls, bicycle desks and movement breaks -- are only part of the solution? What if they won’t fix the underlying problem, that today’s children don’t get enough whole body movement to be attentive and engaged in school? Pediatric occupational therapist Angela Hanscom has railed against what she calls the “constant upright position” in which children spend too much time, limiting their ability to pay attention because their core muscles aren’t developed enough to keep from fidgeting. “It is rare to find children rolling down hills, climbing trees, and spinning in circles just for fun. Merry-go-rounds and teeter-totters are a thing of the past,” she opined in The Washington Post. According to Hanscom, one of the keys to maintaining attention in school is the development of the vestibular, or balance system, located in the inner ear. “In order to develop a strong balance system, children need to move their body in all directions for hours at a time,” she wrote. Whole body movements like spinning in circles and rolling down hills do much more than burn calories; Hanscom said that they engage the hair cells in the inner ear, helping to develop balance, vision and attention. All three are desperately needed for kids if they are expected to pay attention to learn. “Standing can be just as bad as sitting,” Hanscom said about students using standing desks. “From an OT standpoint, it’s still an issue -- if you’re just standing, you’re not getting rapid vestibular movement. You need to move your head in all different directions. If you’re standing still, you’re not moving your head left and right.” Until children get meaningful movement, and lots of it -- she recommends multiple hours a day, whether in or out of school -- their attention will not improve. Mark Benden doesn’t disagree. “There is no replacement for running and playing. Motor skill development is so critical for young children, and it’s very vital that that happen, no question about it,” he said.